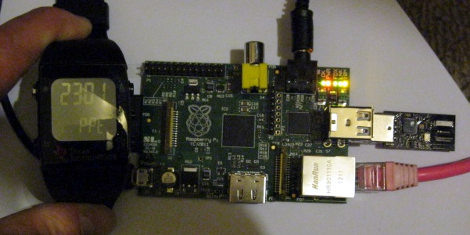 Nice, I was just thinking of seeing of the Access Pointed worked in the RPi. I just got a CommandIR working so this will be a nice addition to home automation. Click my name for my blog, I should be posting about it soon. I have a Chronos but man! It consumes battery! I wanted to do RF control and automation but no… my budget will not allow buying this cheap batteries once a month. I am still using the original battery and it has been months since I bought it. I even did data logging while take off and landing on a trip. Check out the openchronos fork at http://openchronos-ng.sourceforge.net. I rewrote most of the code for a smaller firmware. The battery savings should also be better. I have been using the same battery in mine for a year now, and the voltage is still high. Maybe the software you are using isn’t using low power modes? I have been using OpenChronos, compiled on Linux, with great success. First sign your battery is getting low is you not being able to flash the chronos via RF, when enabling RF the voltage drops and the brownout detection kicks in resetting the clock. My battery lasted more than a year, with regular clock usage + casual random flashing by RF for development. What is considered high voltage? Mine is 2.96v and its is resetting went I turn on the radio. I didn’t realize it was the battery till this post. I wrote an code on python to read the acc data on the raspberry pi but it has a problem, if you have time i would send it to you and you have a look on it.